With cases of pertussis (or whooping cough) on the rise in Texas, a new screening test will allow physicians positively identify the disease faster than many other tests. Whooping cough is a serious disease that causes severe coughing. It can be deadly for infants, but it is preventable with the DTaP vaccine. But after one or two weeks, coughing sets in. Infants and children cough over and over, very hard. After a coughing fit, children can make a “whooping” sound while gasping for breath. Babies may not cough or make the same sound. Coughing can be so severe it makes it hard to eat, drink, sleep and even breathe. Sometimes babies and children even turn blue from lack of oxygen after coughing fits. The disease can be spread when a person infected with pertussis coughs and it spreads through the air. People who have the disease can infect others while they have the cold-like symptoms and for two weeks after coughing fits start. Babies and children often become infected when an adult or older sibling spreads the disease because they do not know they have it. California has reported an outbreak of pertussis. 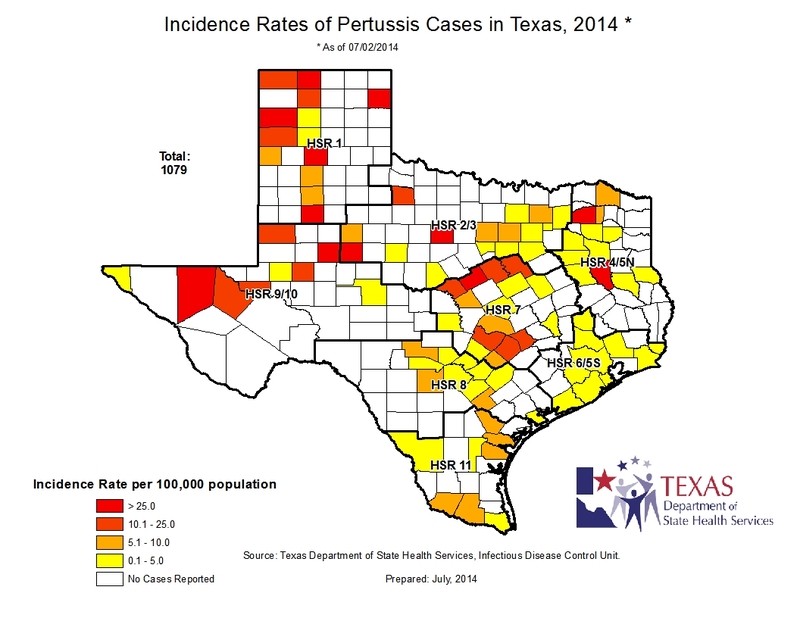 Texas does not have a pertussis outbreak, but cases of the disease have been on the rise. According to the Texas Department of State Health Services, as of July 2, 2014, there were 1,079 cases of whooping cough. Of those, 12.5 percent required hospitalization. There have been two deaths. The best way to prevent whooping cough is vaccination. The DTaP vaccination is a combination immunization that protects from diphtheria, tetanus and pertussis. The Centers for Disease Control and Prevention recommends five doses of DTaP at specific times during childhood for the best protection. Vaccine protection decreases over time, and there is now a booster vaccine available for preteens, teens and adults. The pertussis vaccine not only protects those who receive it, but also those who have not been vaccinated, such as infants. Almost everyone who is not vaccinated and exposed to pertussis contracts it. Before the vaccine, 8,000 people died from pertussis every year, according to the CDC. After the vaccine became available, that number dropped to fewer than 40 deaths per year. Doctors use lab tests to detect infection of Bordetella pertussis — which causes whooping cough — because early diagnosis and treatment may help reduce the severity of the disease. Some of the tests that detect a Bordetella pertussis infection can take several weeks to report results. But newer tests can speed up those results. ADC’s Laboratory Services is currently studying a test called Pertussis by DNA Amplification. Clinical sections will swab samples from patients with a suspected whooping cough infection and use molecular DNA amplification to find out if Bordetella pertussis is the cause. ADC Laboratory Director Christopher Ellis says if the specimen is submitted during testing hours, results could come back the same day. Ellis says the test may be available as soon as September at ADC. There are a variety of treatments for a Bordetella pertussis infection. Infants are often hospitalized because of the danger the disease poses in this age group. Children and adults are often treated at home, but they may need to be isolated from others to prevent the spread of the disease. Doctors prescribe antibiotics for pertussis because it is a bacterial infection. Family members may also be given antibiotics to prevent the infection from spreading. Over-the-counter cough medications do not have much effect to ease the cough and may be discouraged.